© Larson et al. ; Licensee Bentham Open. Encapsulating Peritoneal Sclerosis (EPS) developed in an African American male who had been on Peritoneal Dialysis for nine years. During his hospitalization for peritonitis, he continued to clinically deteriorate with refractory abdominal pain, vomiting, and anorexia requiring Total Parenteral Nutrition. This case demonstrates the importance of prompt EPS diagnosis and the technical challenges associated with surgical treatment. Keywords: Encapsulating peritonitis, peritoneal dialysis, peritoneal sclerosis, peritonitis. 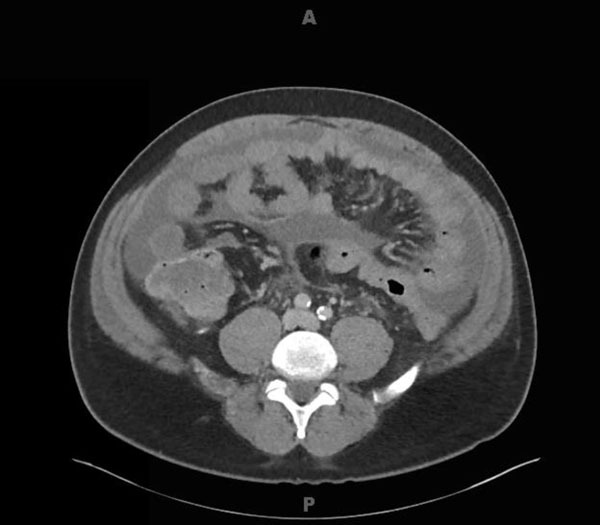 A 47-year-old African American male with end stage renal disease secondary to Thrombotic Thrombocytopenic Purpura, on peritoneal dialysis (PD) since 2006 presented in 2015 with abdominal pain and cloudy PD effluent bags due to PD peritonitis (PDP). He was a High-Average transporter and in 2007 had one episode of coagulase-negative staphylococcus PDP which resolved with antibiotics. During this admission, in view of his poor response to antibiotics and worsening clinical symptomatology, his PD catheter was removed. A computerized tomography scan (Fig. 1) raised suspicion of encapsulating peritoneal sclerosis, and in view of persistent symptoms of bowel obstruction, he was put forward for peritonectomy and enterolysis. A longitudinal midline incision was made and the cocoon was carefully separated from the anterior abdominal wall (Fig. 2a). The peritoneum had a dense peritoneal rind that was evident. Next, starting inferiorly, bowel loops were separated from the overlying inflammatory rind inch-by-inch. No enterotomies were made during the procedure. The bowel had a very unusual appearance, which appeared to be ruddy and leathery with grooves and a golden luminescent-type appearance under the light. The dense capsule was carefully taken down and bowel was freed up from the ileocecal valve to the ligament of Treitz (Fig. 2b). The dense adhesions to the liver were carefully separated. The abdominal fascia was closed and the patient tolerated the procedure well. Even with the advances in surgical techniques for advanced EPS, the post-operative mortality ranges between 19-35% . especially in those who present as surgical emergencies. The recurrence rates post-surgery have been reported as high as 25% [2, 3]. Despite the good outcome in our patient, PD patients, especially with high transporter status who choose to remain on peritoneal dialysis for more than 5 years, need to be counselled on this devastating complication of peritoneal dialysis. There is moderate to large amount of ascites and a membrane coating the bowel measuring roughly 2 to 3 mm in thickness with some enhancement. There is also some evidence of membrane formation along the parietal surface of the peritoneum. There is no evidence of plaque-like calcification. (a) The coccon encasing the bowel loops after it was carefully separated from the anterior abdominal wall. (b) The bowel loops can be seen here after the capsule was carefully taken down and the dense interloop adhesions were lysed. Kawanishi H. Surgical and medical treatments of encapsulation peritoneal sclerosis. Contrib Nephrol 2012; 177: 38-47. Moinuddin Z, Summers A, Van Dellen D, Augustine T, Herrick SE. Encapsulating peritoneal sclerosis-a rare but devastating peritoneal disease. Front Physiol 2014; 5: 470. Habib SM, Betjes MG, Fieren MW, et al. Management of encapsulating peritoneal sclerosis: a guideline on optimal and uniform treatment. Neth J Med 2011; 69(11): 500-7.